The UK’s biggest annual celebration of Arab culture will bring three of the Arab world’s most ground-breaking and internationally renowned artists to the city for the opening weekend of its 20th anniversary festival. Liverpool Arab Arts Festival’s (LAAF) enhanced musical programme will enjoy a spectacular opening weekend with a performance from internationally acclaimed singer-songwriter and the “voice of the Tunisian revolution”, Emel Mathlouthi on Saturday 7 July at the Invisible Wind Factory. On Friday 6 July the festival will also present an enthralling and powerful co- headline performance from Arab electronic hip-hop supergroup 47SOUL andTootArd, a trailblazing ensemble from the occupied Golan Heights, at Constellations in the Baltic Triangle. Continuing its mission to provide Arab arts and culture with an international reach, to bring diverse groups of people together and to increase the public’s knowledge and appreciation of Arab culture and its people, LAAF presents Emel Mathlouthi as she enters a new phase of her extraordinary life, with a powerful, heartfelt performance of tracks from her sophomore album Ensen (Human), as well as her 2007 recording and viral anthem of the Arab Spring, Kelmti Horra (My Word is Free). Emel’s genre-defying music melds electronica and Tunisian textures into her unique cinematic universe, blending acoustic and electronic sounds into a style wholly her own and drawing together Tunisian instruments such as gumbri (bass lute), zukra (flute) and bendirs (frame drums) with heavy kick drums and atmospheric melodies. Emel’s music and message motivates people across the world to express their true self. A pillar of strength for women worldwide in particular, she stands in opposition to the perception that behind every woman singer is a man pulling the strings, composing and co-producing all of her releases. 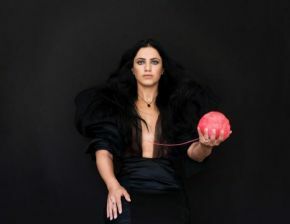 Emel says: “In my latest album and new phase in my musical life I am rebelling against the caricature of myself that has been created as a result of role in the Arab Spring. This is just one part of my story and now my battle is to reveal the true and fullest version of myself through my music. Setting the tone for a weekend of inspirational and cutting-edge Arab music, 47SOUL will bring their unique combination of Dabke, traditional Palestinian street music and dance, with deep electronic beats mixed with the sounds of the Middle East, to Liverpool’s Baltic Triangle, performing tracks from their first full-length studio album Balfron Promise. Creators of their own genre Shamstep, which fuses hip-hop and pop lyrics in English and Arabic, the four-piece band – whose members hail from Palestine and Jordan – will return to LAAF to deliver one of their energetic and intoxicatingly otherworldly live show, which they are now globally renowned for. Sharing the stage at Constellations with 47SOUL is TootArd. These outstanding musicians, steeped in classical and jazz traditions, use their musical mastery to fuse the Arabic modalities of the Levant with North African desert blues - with more than a nod to reggae and psych-rock. The band are from the Golan Heights, an area that was part of southern Syria until 1967 when it was annexed by Israel, although none have Israeli citizenship which is reflected in their "Laissez Passez" travel documents, also the name of their debut international record for Glitterbeat Records. Hasan from TootArd says: "We're massively looking forward to playing Liverpool Arab Arts Festival, the first chance we'll have had to visit the city. The impressive line-up of internationally acclaimed Arab music stars is part of LAAF’s enhanced musical programme for 2018, facilitated by the provision of additional resources as part of the Liverpool 2018 celebrations. Earlier this year LAAF was one of 14 festivals provided with extra funding from the Festival Enhancement Fund, allowing an even more ambitious musical programme as the city celebrates a decade since its year as European Capital of Culture. Liverpool’s Director of Culture, Claire McColgan, said: “Each year Liverpool has an incredible calendar of events, so as part of the Liverpool 2018 programme we are giving additional support to some of our much loved festivals to help them curate their best line-ups to date. “LAAF is a real feast for the senses and the acts taking to the stage are of an exceptional caliber which will be a wonderful celebration of Arab arts and culture. The festival’s 20th anniversary edition will also include its ever-popular Family Day on Sunday 15 July and a packed programme of visual art, music, dance, film, theatre, literature and special events showcasing the richness of Arab culture, all taking place in venues across the city.